The fire that has destroyed the roof of Notre Dame Cathedral in Paris has shocked the world. The photographs show tremendous flames reaching up into the night sky and the horrifying collapse of Viollet Le Duc’s 1860s flèche (spire), though, fortunately, the statues of the 12 Apostles at its base were removed last week. Although neither the full extent to the destruction is yet known nor the cause the of the fire, it should be noted how much worse the destruction might have been, had it not been for the vaulting beneath the roof. 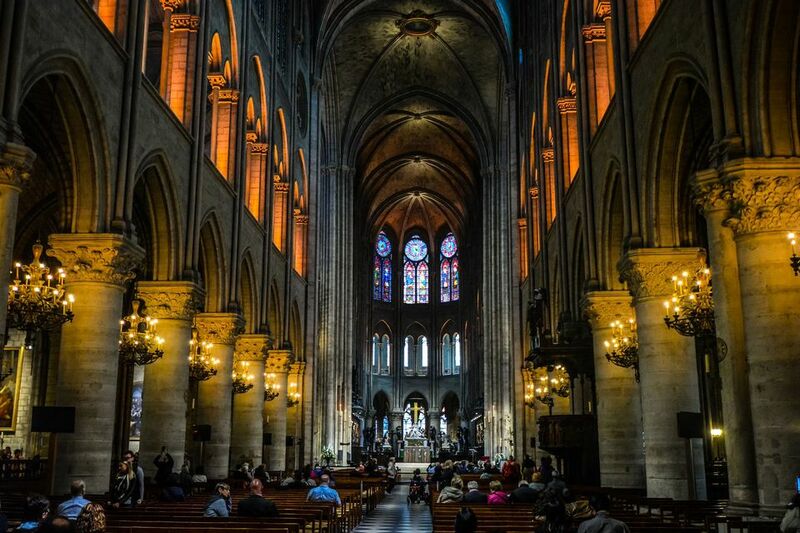 From the Roman era, builders had been able to create stone vaulted buildings, a technique that reached a point of perfection in the High Gothic era when Notre Dame was built. From simple barrel and groin vaults builders were, through combinations of stone ribs running up columns and weaving over the ceiling (along with buttressing in and out) to raise ceilings higher and higher. The only problem with this heightening effect was that the stone vaults remained permeable by rain and snow. The solution was to build wooden roofs covered with lead sheets over the stone vaults to protect them from the elements and to give the churches and cathedrals ever taller profiles. The wooden roofs were relatively light and require no further supports. So far, it seems the fire has destroyed the roof, but, apart from the stone vaulted crossing which collapsed when the flèche above fell, the interior has not been scathed by fire. There will be, of course, considerable smoke and water damage and it will take years and decades to restore the roof. We have the 13th-century builders’ and masons’ stone vaulting to thank for the preservation of, among other things, the rose windows of the transepts and the statuary of the chancel, not to mention the structure of the church.